The aircraft was 8,5 miles S of the airport on an ILS back course approach to runway 01 when the crew reported problems with the propeller cruise lock. The prop could not be feathered and the aircraft struck a house 3,5 miles short of the runway. PROBABLE CAUSE: "The inability of the crew to feather the left propeller, in combination with the descent of the aircraft below the prescribed minimum altitudes for the approach. The Board is unable to determine why the left propeller could not be feathered. 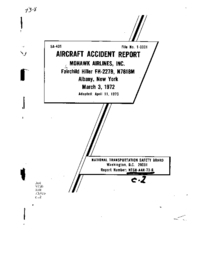 Contributing causal factors for the nonstandard approach were the captain's preoccupation with a cruise pitch lock malfunction, the first officer's failure to adhere to company altitude awareness procedures, and the captain's failure to delegate any meaningful responsibilities to the copilot which resulted in a lack of effective task sharing during the emergency. Also, the Board was unable to determine why the propeller pitch lock malfunctioned during the descent." Distance from New York-La Guardia Airport, NY to Albany Airport, NY as the crow flies is 218 km (136 miles).